Does Glass shape influence taste? The more dedicated wine glass manufacturers think so. That’s why they talk to wine makers and oenologists before bringing out a new design. But it’s something you can easily prove for yourself.Take out as many different glasses as you can lay your hands on. Tumblers, tulips, goblets, flutes, sherry, liquor; it doesn’t really matter other than to get four or five radically different shapes for comparison. Then pour the same wine into each. Give them a good swirl. Now sip away and you’ll think you are tasting and smelling four or five assorted wines! store all these different shapes and sizes.Don’t get me wrong. 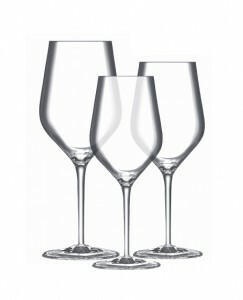 The right shaped glassware can showcase the nuances of wine, especially in a variety as subtle as, say, Pinot Noir. But while it may be a lot of fun to have a huge bowled Merlot glass, another for Cabernet Sauvignon and a third for Gamey, what ‘s the best glass for say Chianti, which can be a blend of Sangiovese, Canaiolo and maybe even Merlot or Cabernet Sauvignon grapes? Faced with just this dilemma the top Italian glassware manufacturer set out to create just four glass shapes, for red, white and sparkling wines, that would maximise the enjoyment of aroma and flavour across all the varietals. Series Hi-Taste Glassware challenges the preconception that says superlative glassware needs a proliferation of designer shapes and a premium price tag. As you will discover from your own glass test, open necked glasses like tumblers or tulip shapes with a flared rim wider than the bowl, produce the worst results. These sort of shapes allow the richness of the aromas to escape too quickly, flattening out the best of vintages. You need stems too, especially for white wines – nothing warms a wine faster than a hot clammy hand clasped around the bowl! Rims also should be lip friendly, rounded and well formed. It was just these sort of practical consideration that the top-quality Italian winemakers brought to the task, influencing design. Hi-Taste glassware represents a break-through in modern automated blown glass technology, offering double the normal resistance to shocks. This has been achieved with the addition of Nesium™ a new wonder proprietary alloy, that gives these glasses core strength, elasticity and durability without compromising clarity. Withstanding intense usage and repeated dishwasher cycles, Hi-Taste glasses maintain their sparkling appearance consistently outperforming their contemporaries. Do glass shapes affect wine taste? Undoubtedly. But you don’t have to spend a fortune to buy well made, well researched glasses that will truly enhance your enjoyment and pleasure of wine.